PC Gamer has posted a new article on the state of FMV both yesterday and today. 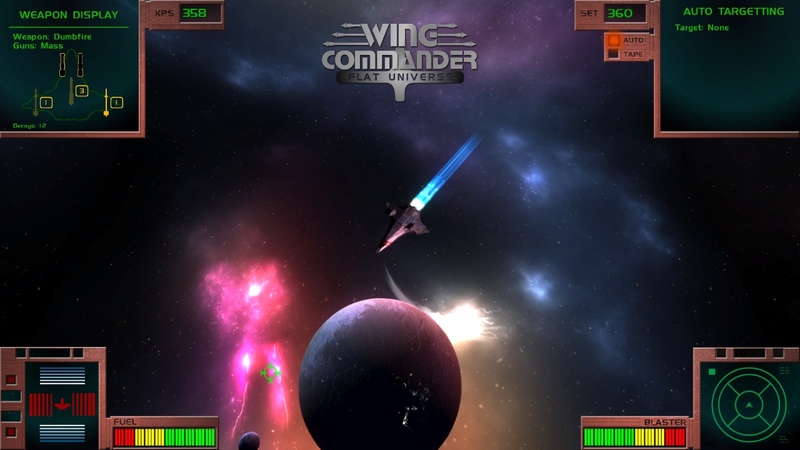 They point out the genre's rocky history, but Wing Commander is called out as a major exception that stands the test of time despite some technical limitations. Although live action cutscenes are largely seen today as a relic of a bygone era, the author highlights how they continues to pop up in new places. Live action trailers for games that don't use FMV are becoming increasingly popular. And developers have stepped up their storytelling, so more new titles are finally reaching heights originally achieved by classic '90s WC titles. Check out the full article here. Thanks to Delance for the tip! The Maslas Brothers have released a whole bunch of tantalizing new screenshots for the next iteration of Wing Commander Flat Universe. 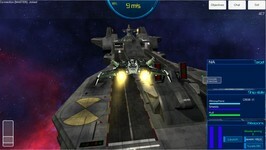 All images are either gameplay screenshots or otherwise rendered in the engine. These new pics show off the custom cockpits that frame the action: the angular green Hornet, squared off red Scimitar, silver curved Raptor displays and more are all there. Even the gun energy capacitors are designed to match! 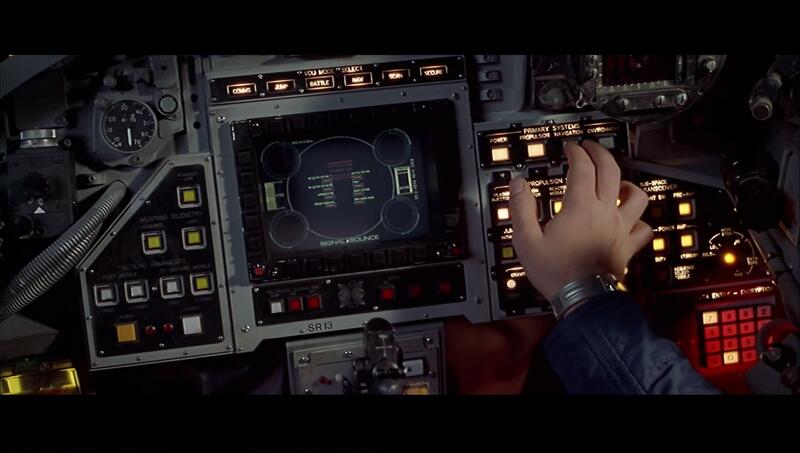 We also get a glimpse of the nav interface that will soon be helping pilots get around as well as some glamor shots of Klavs' hardware in a variety of locations. Wing Commander Arrives On US Netflix! 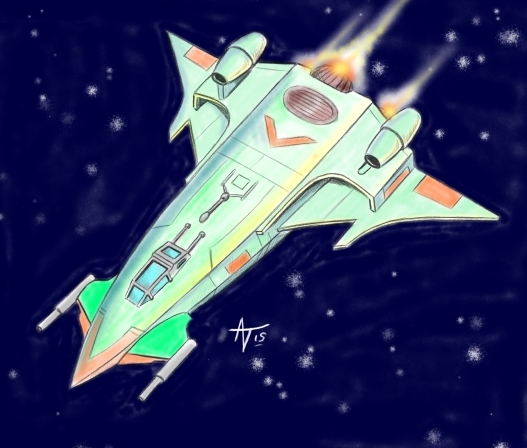 In the 27th century, Earth's only hope against the vicious Kilrathi Empire are two talented young fighter pilots. 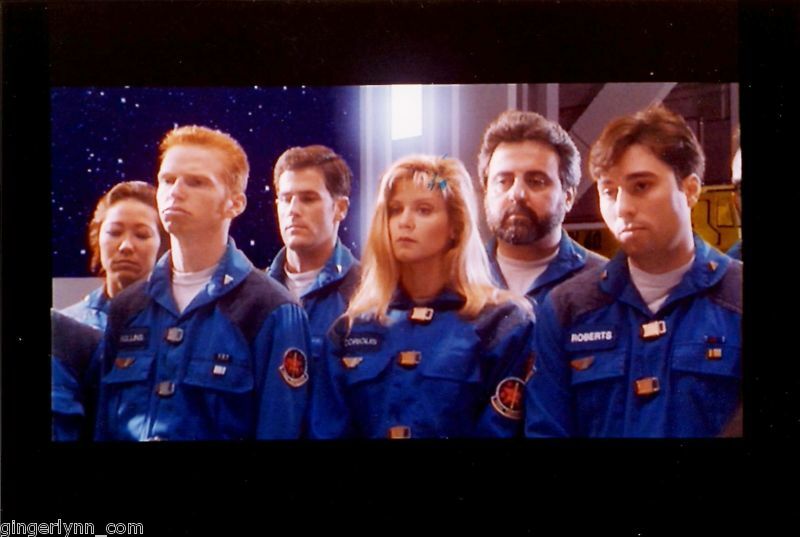 The guys, with their beautiful, tough-as-nails wing commander Angel, try to fend off the enemy and warn Earth of an impending attack. 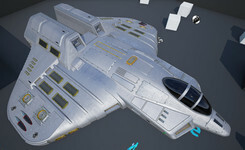 ScoobyDoo has made big progress importing his new Bearcat fighter into the Unreal 4 engine. 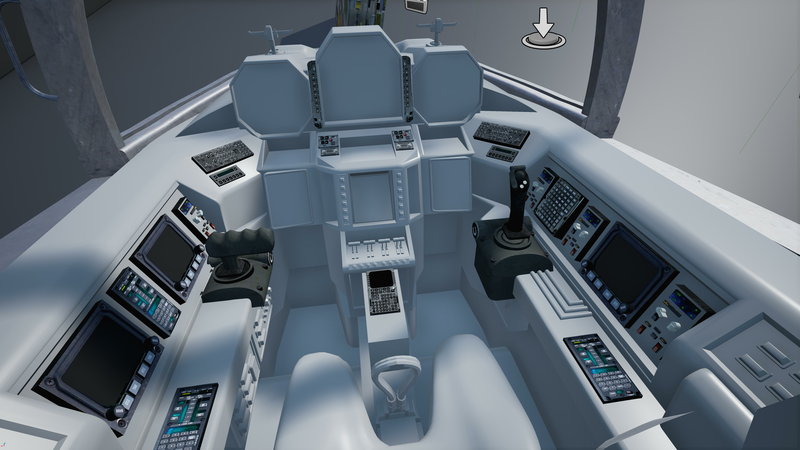 In this new environment, he's been able to add tons of detail to the cockpit, hull surface and landing gear. 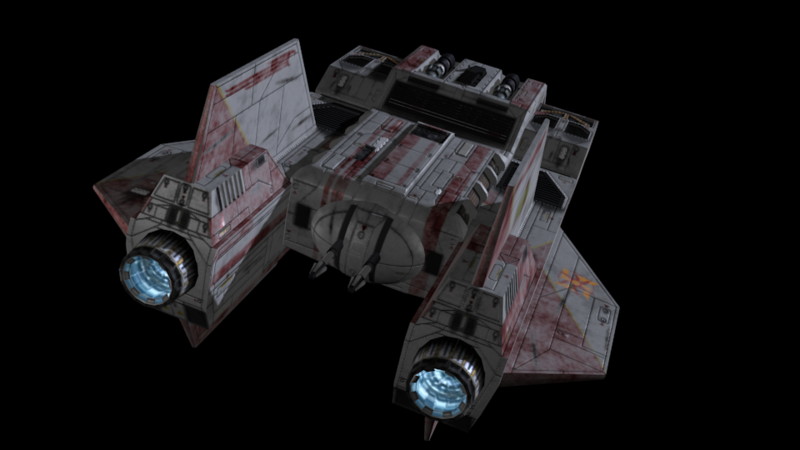 Although he's known for adding lots of stuff like this to his ships in the past, he's being careful to walk a fine line and avoid making his ships deviate too wildly from the baseline Wing Commander examples. If you'd like to see more of the spaceframe itself, check out the previous post here. This design should be reading to import into various projects that use the Freespace 2 engine soon. 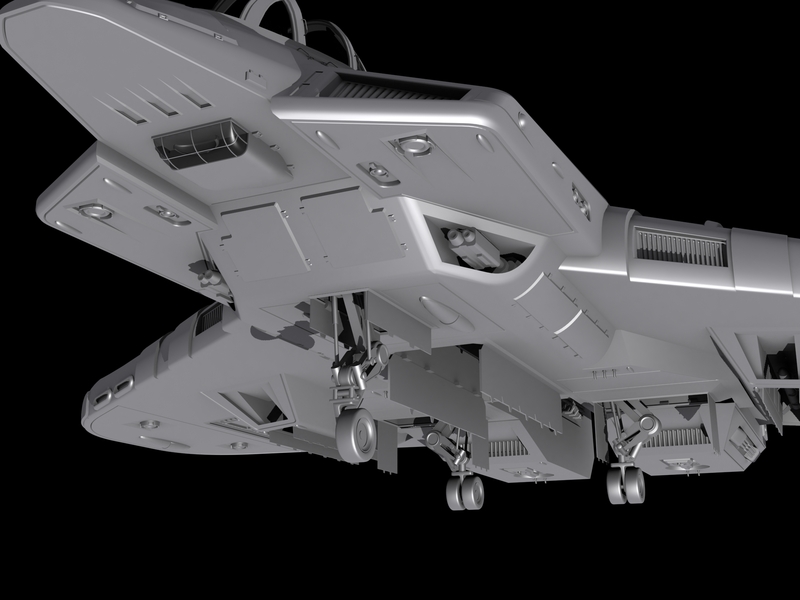 My main line of thinking was, I can't do a million greebles like S.C. models, it just wouldn't look WCish (heck even the Kilrathi isn't nearly that greebled). I decided to go with panels and small details. I would have liked to added more panels but it would start looking like it was patchworked. The big thing I'm going to have to deal next with is panel scribing (like what you use to do with physical models to bring out panel lines). That's going to take some rethinking on my part. The panel lines I've used in the past look ok, but somehow I don't think they would fit in nicely here. 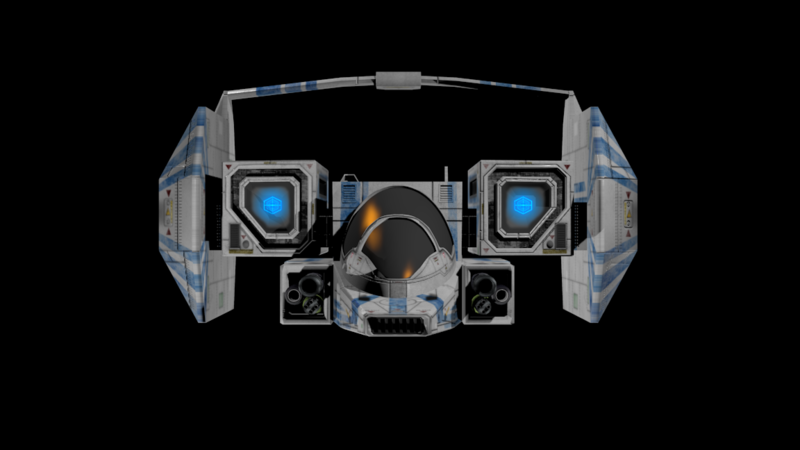 Cockpit is finally coming together, I merged some of mine with one of the SC cockpit models, reworked and optimized. 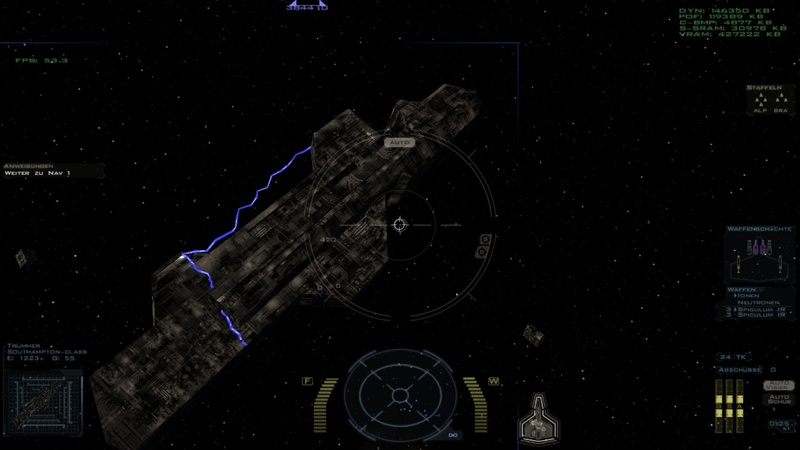 I think SC is using some sort of tessellation in their meshes and I'm not familiar enough to work with that. 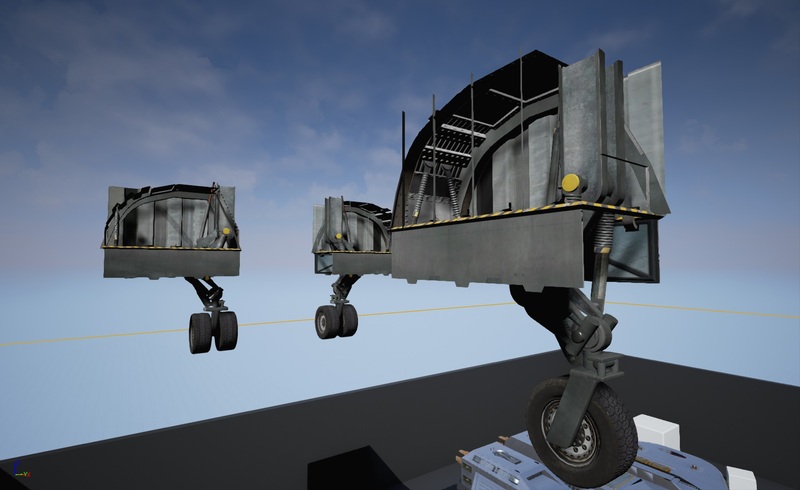 Wheels are fully animated, however until FSO support dae animation, they won't be useable in FS2, too many separate moving parts. The Border Worlds faction is getting some nice upgrades to their torpedo-carrying fighters in the WC4 Homeworld mod. L.I.F. 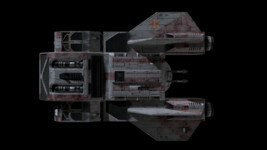 has just finished importing DefianceIndustries' Vindicator and Avenger into the Remastered engine. Either craft can do some serious damage to Confed, Kilrathi and Black Lance capships, and the Stormfires that will also be added to their arsenal will chew up fighters too (that aren't nimble enough to get away!). Try the mod out for yourself here. The Vindicator is a medium-fighter armed with anti-ship torpedoes, a pair of laser and tachyon guns. Despite is relatively light anti-fighter armament, it represents a clear threat for frigates and smaller capital ships and should not be underestimated. The Avenger torpedo bomber is a large, unwieldy craft reminiscent of a shuttle, however packed with as many anti-ship torpedoes as a longbow, and is reported to be a tough enemy to shoot down, especially with its dangerous rear mass driver turret. Prioritize it as you would a squadron of Paktahn threatening the Admiral's latest toy. Three Weeks To Party Time! In case you missed our recent announcement, the date and time for the CIC's 17th Birthday Party has been set! You're invited to join us on Saturday, August 15, 2015 at 7:00 pm EDT (4:00 pm PDT and 11:00 pm GMT) in the #Wingnut chat room. It'll be fun night full of old war stories, cake, trivia games and prizes. We'll have plenty of fun stuff to share here at the website too! 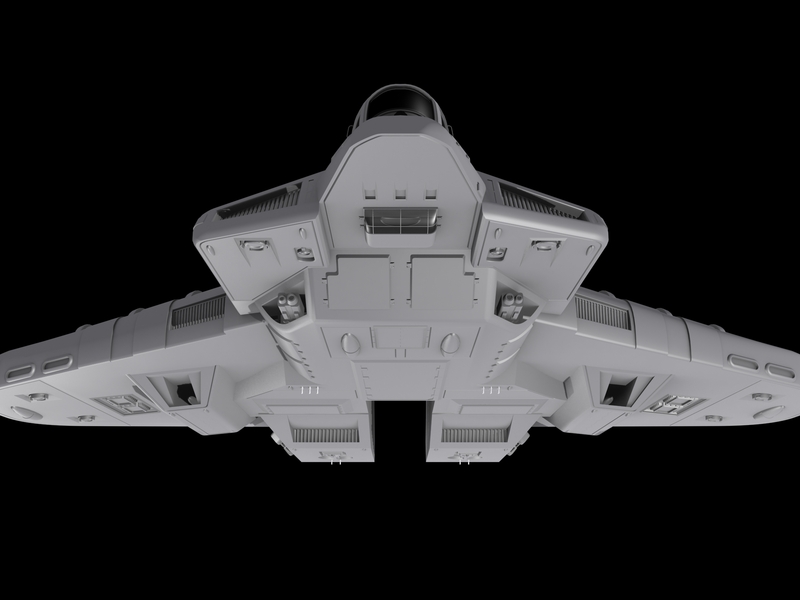 M3RcAden has built quite a few Confed ships for his Sins of a Solar Empire mod, so he's branching out more now to the Kilrathi side. 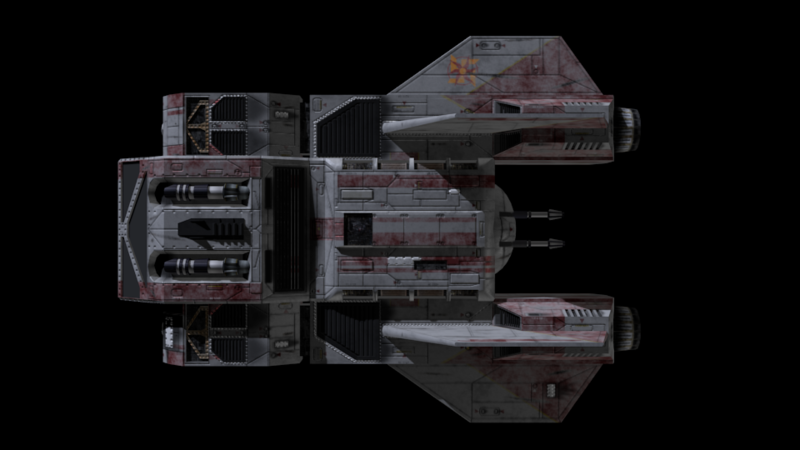 First up is the Kamrani corvette. 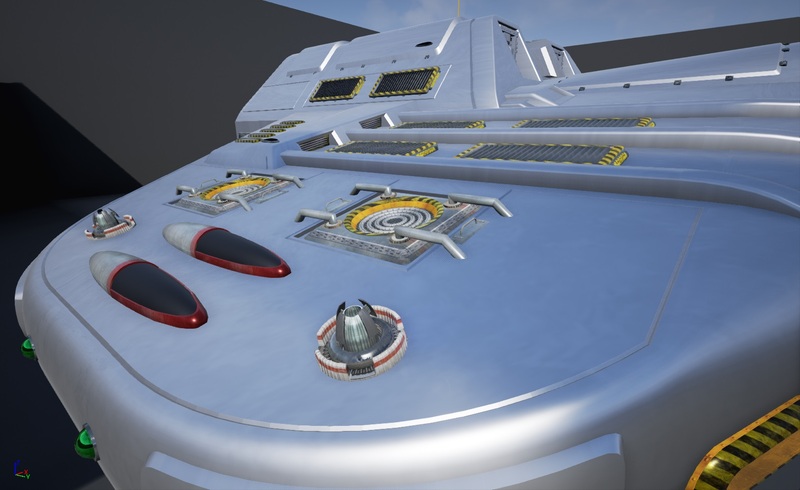 Check out those beefy turrets! 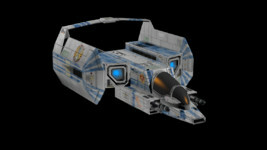 This is a common ship for mods to incorporate first, because of the relatively straightforward shape combined with how common they're expected to be. 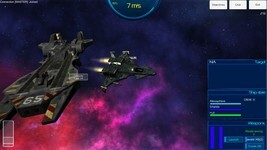 He'll continue to focus on capital ships next before getting down to the fighter level. 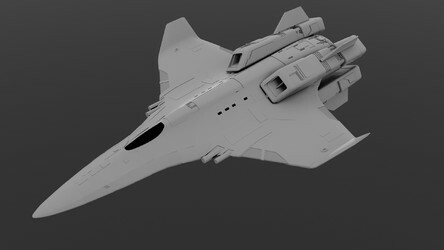 Kilrathi Corvette basic mesh completed. 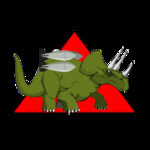 Here it is, and let me know what you all think. Over the next three days, GOG is discounting their entire EA catalog by 60%. 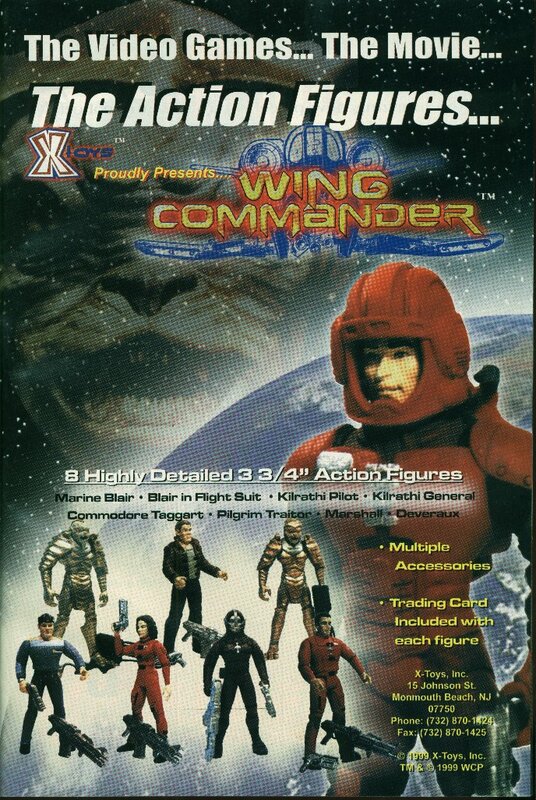 Besides Wing Commander, Ultima and Crusader, their offer includes beloved classics such as Theme Hospital, Theme Park, Dungeon Keeper, Kyrandia and Populous. While you can buy an entire series outright for the sake of convenience, you can also handpick a few individual titles, many for as little as $2.39. 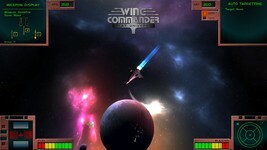 The Wing Commander bundle in particular offers incredible value. 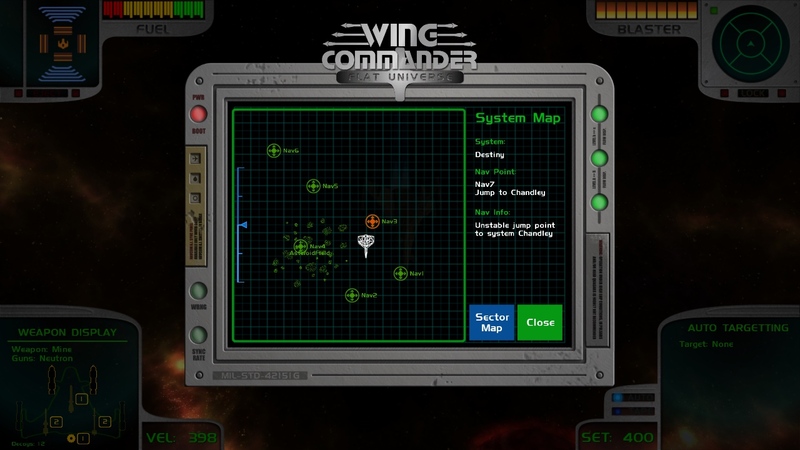 All the expansions are included, WC3 comes with a digital copy of the Fleet Action novel, WC4 is the high quality DVD edition, and many games come with the official strategy guides and more. 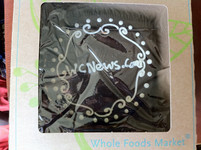 Buy it here, for yourself or as a gift. 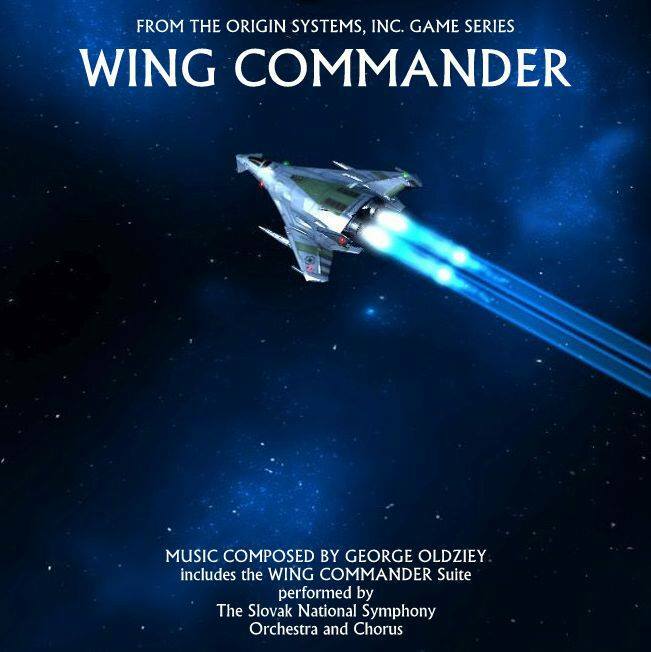 Former Origin composer George Oldziey has posted another fantastic sample from his live recording of Wing Commander music in Bratislava last year. 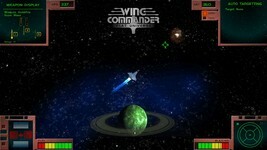 This time he's enhanced the introduction to Wing Commander 4 with his new audio. The results are amazing! After you give it a listen, you can compare this version to the original here. 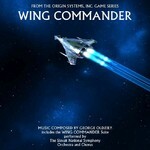 20 years ago, I had the privilege of composing the music for 3 of the Wing Commander games by Electronic Arts. 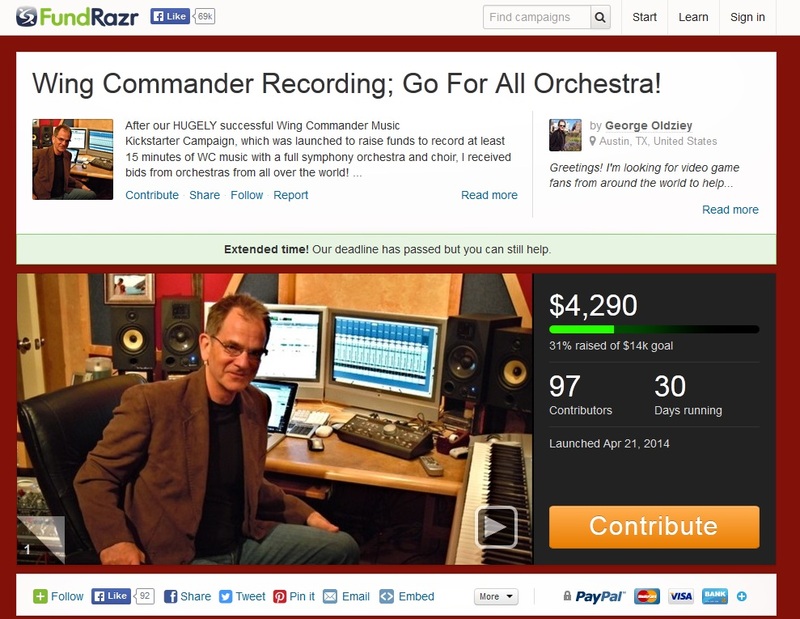 Many of you may know I was blessed with a successful crowdfunding campaign that enabled me to record some of that music last fall with the Slovak National Radio Orchestra, conducted by Allan Wilson. This is the way I always envisioned the music. Since I didn't have access to any of the audio assets, I basically just dropped in the new orchestral track over the old video. Since the music was so low in the original mix it seems to go reasonably well with the original audio, with some tweaks here and there. I know the music is a little hot in the mix, but after all, I AM the composer :) That's probably why they don't usually invite composers to final mixes! 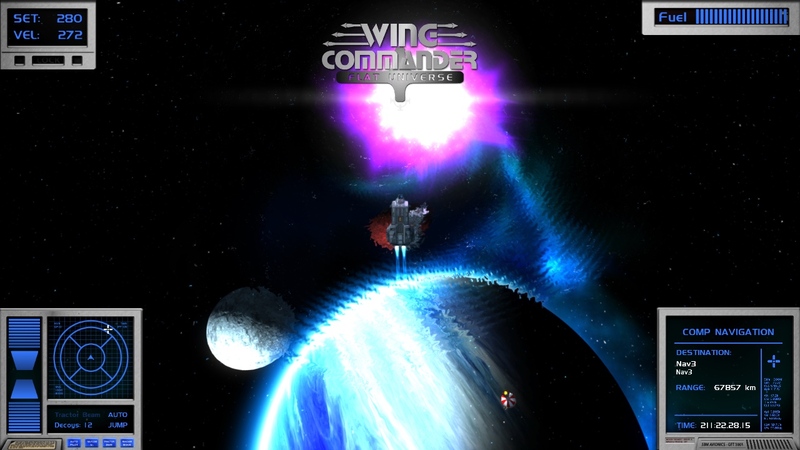 BTW, the ending music is different, because it is now part of the "Wing Commander Suite" and is intended for live performance. 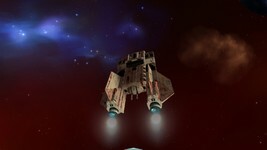 Arraen has released a pair of new photos featuring a Rapier II circling the Concordia. He notes that his strategy game, Starship Tactics, is about fleet engagements, but he couldn't resist putting Klavs' slick fighter into the mod. The Venture, Kamrani and Tallahassee are already playable, and the Fralthi or Ralari are potentially up next. If you have a preference, let Arraen know at the CIC Forums! 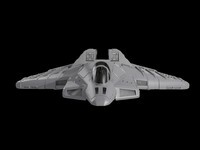 DefianceIndustries is back with another Border Worlds heavyweight, the Avenger bomber. 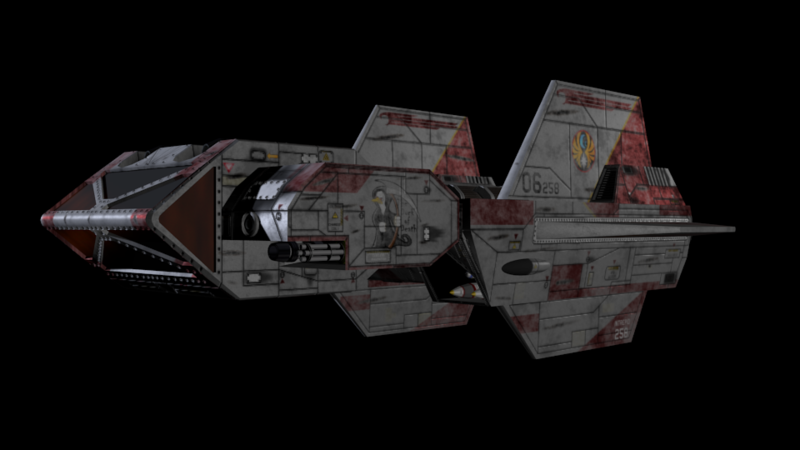 He's put together this gorgeous take on the design to spice up the ship in the Homeworld mod. A nice touch here is that you can see the ordnance stocked in the weapon bays. 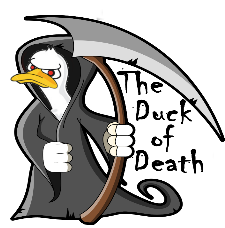 This particular craft is labeled #258, the "Duck of Death." Some snazzy nose art follows the pretty ship pictures below. 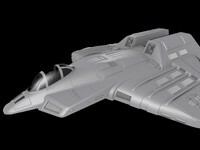 Also take a peek at DI's Vindicator here. 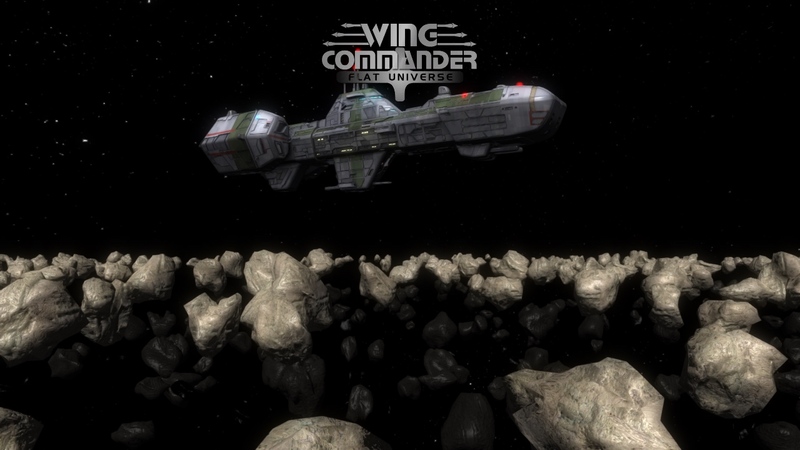 It's been a while since we checked in with capi's Wing Commander RPG, and he's made consistent progress virtually every single week. 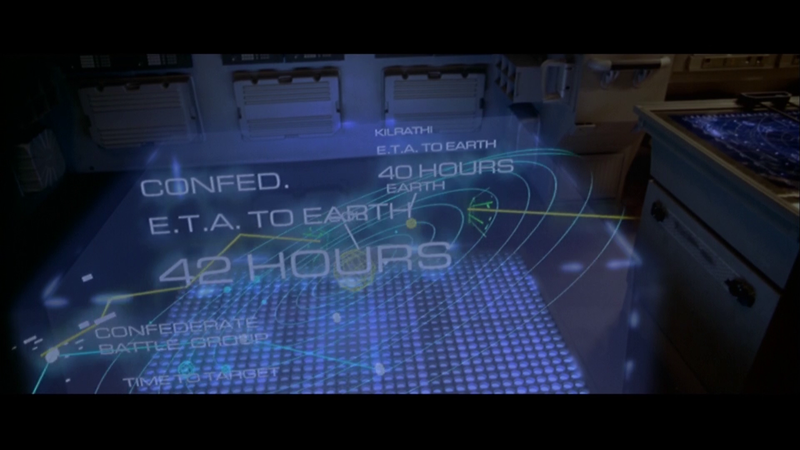 In June he dived into the exposition that sets up the Kilrathi expansion module's backstory. 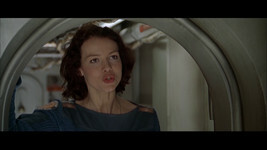 It includes multiple scenes such as a flashback to the day Bloodeye N'Ryllis learned of Kilrah's destruction. Everything points to this aspect being pretty neat fan fiction in its own right! Some of the dialogue conversations will be translated into Kilrathi using the techniques he's been working out. There may even be a standalone lexicon 'treatise' released in the near future. This past week saw the same thing as the last couple of weeks - namely work in Chapter 2.0 of the Elegy campaign - though this week I can report something accurately designated as "progress". I began the week last week by adding 29 new and re-purposed terms to the Kilrathi lexicon from the previous week's translation work. I am starting to note a slow transition towards "re-purposed" terms (i.e. ones that I've added additional meaning to) as opposed to brand new words. 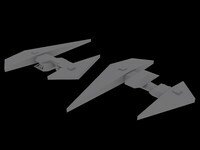 I also made a set of requested changes to the variants of the Shrike bomber and Hercules shuttle for Doc Wade's Victory-class killer capship. After that it was back to work - and I finished the translation of the first scene before the day was out on Monday. The completion of the first scene's translation work wrap's that section up - one down, five to go in 2.0. Sometimes you just need a hand-drawn CF-105 Scimitar to kick off your week. If you're one of those people, NinjaLA has kindly obliged with this specimen. If this isn't enough to do the trick, compare it to to several earlier attempts here and here. Man, I love this new coloring style. 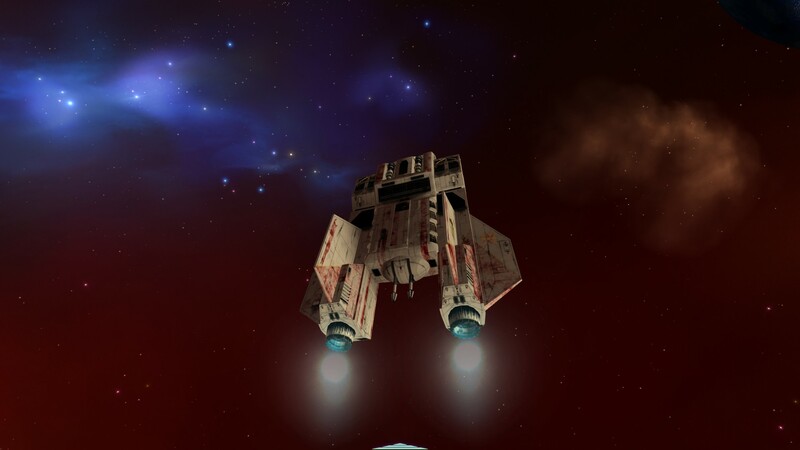 The Cloud Imperium Games team doesn't spend much time focusing on its crowdfunding totals these days, and they've long since discontinued discrete stretch goals for reaching additional milestones. So fans who may not be following Roberts Space Industries too closely may not have seen that they ticked past $85 million this past week - contribute by some 926,000 people. There was a time when the team would've been happy if that many people each donated just a couple dollars, but the fact that the per-person average is north of $90 might be the most impressive number of them all here! CIG is focusing on the upcoming Star Marine FPS component, and they should make a pretty big splash at Gamescom in Germany next month. 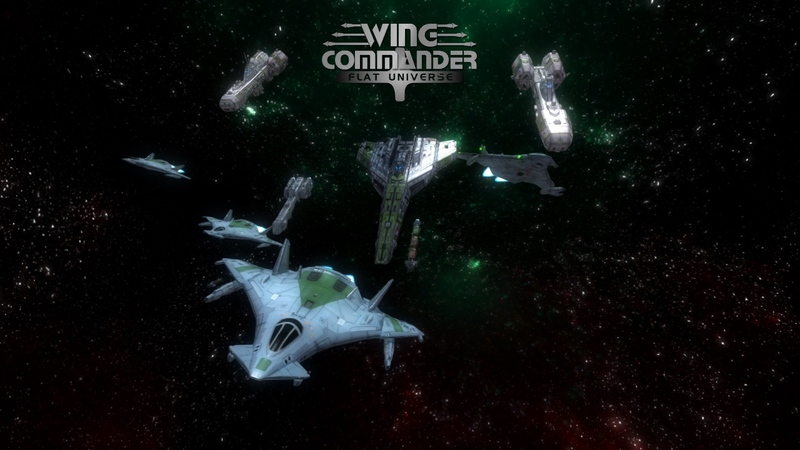 vinzi also put together this fan trailer of Star Citizen footage intermixed with a Wing Commander audio track. For more crossover, check out the CIC Organization over at RSI. 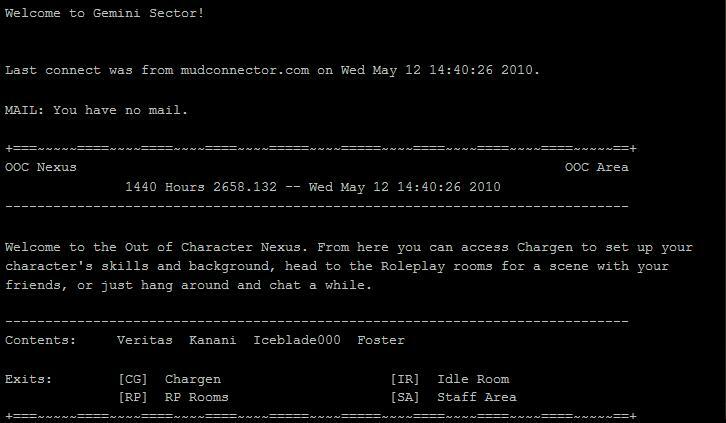 The old Gemini Sector RPG recently transitioned from a classic MUSH style to a message board format that's a bit easier to combine with people's busy schedules. Iceblade has now set up a dedicated website to provide (prospective) players with background information on the storyline, active characters and NPCs. The new website also describes in detail how the combat system works, and visitors can read through RPG session logs to get the feel of the game. 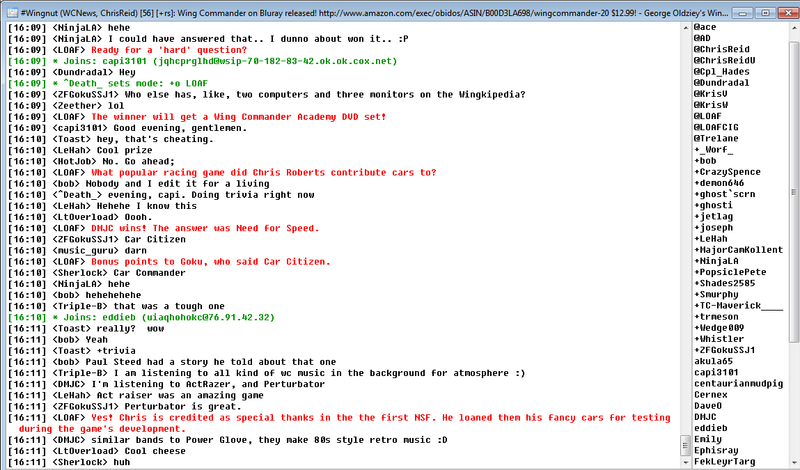 Or jump right into the RPG's forum here! The year is 2659. War between the Terran Confederation and the felinoid aliens known as the Kilrathi has raged for twenty years, with no end in sight. 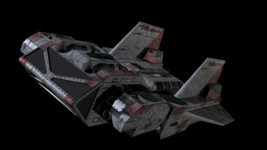 Seeking to break the stalemate, the Kilrathi have launched a surprise offensive through the edge of Terran-controlled space in Gemini Sector. A tenacious counteroffensive has pushed back the first wave of the Kilrathi assault, but a second wave has washed over Confed's forces and placed the Majestic deep behind the frontline. 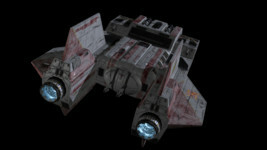 For the pilots and crew of the Majestic, survival is not the only goal as the current circumstances offer them a prime opportunity to cut the Kilrathi offensive off at the knees. 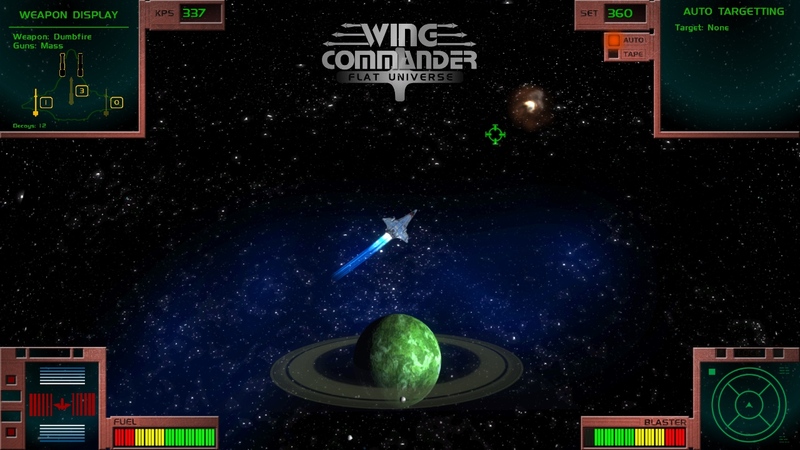 Based on the 'Wing Commander' series of games, Wing Commander: Gemini Sector offers space opera fun in a bureaucracy-light atmosphere. The game is set aboard a single Terran Confederation carrier, the Bengal Class Strike Carrier TCS Majestic. 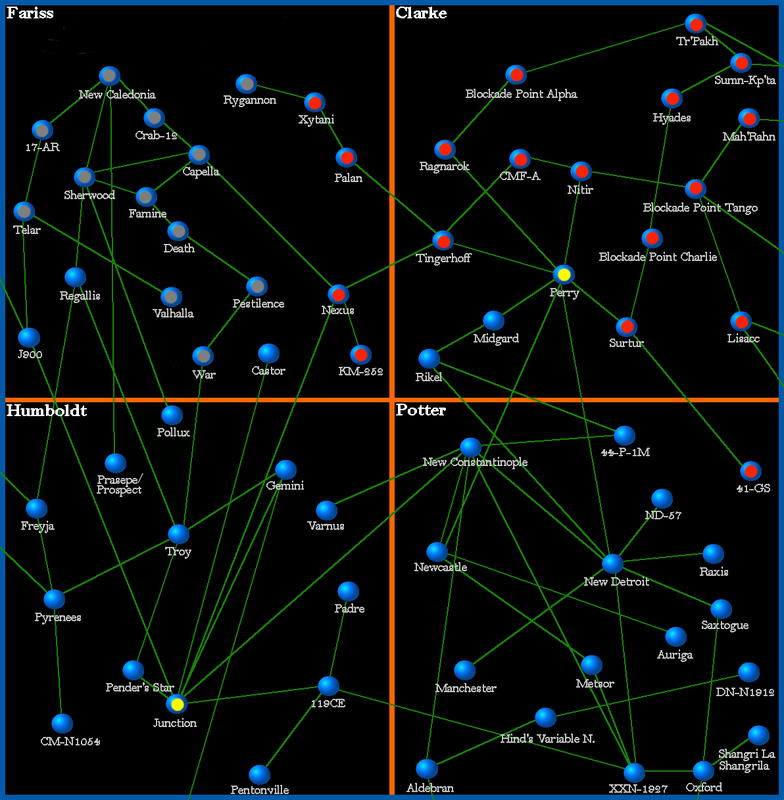 Roleplaying will be GM-driven at first, but if enough people join, I hope to move in the direction of more free-form RP. 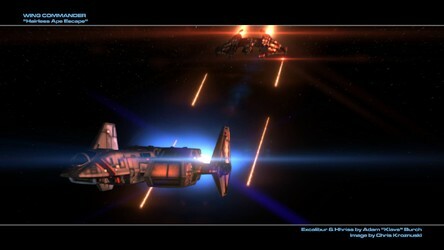 Roleplaying events may take place across various locals such as other capital ships, installations, or planets. Character creation is fairly simple and alts are allowed. 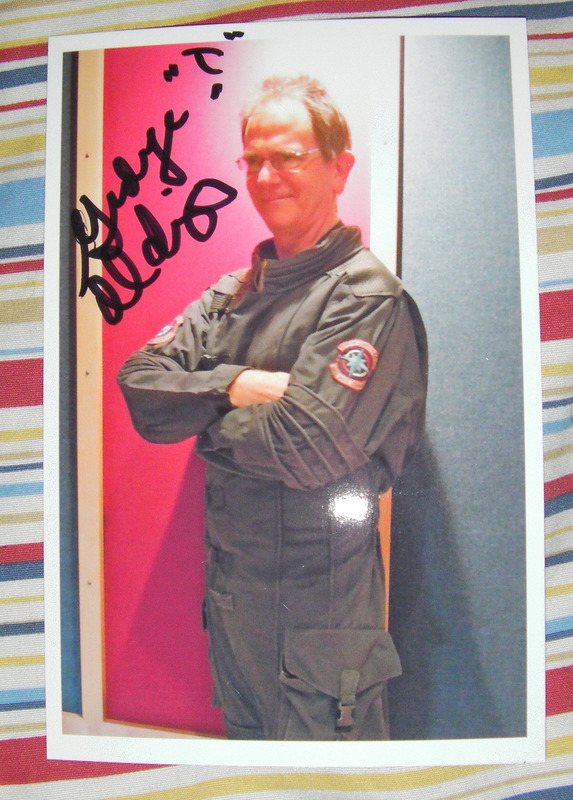 You can create a character who is a pilot, a technician, a marine, or a naval officer/enlisted man. Combat handled by a custom-coded program used by the GM, simply post your action with your RP post. Player death does not occur without consent. 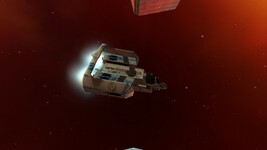 The main plot is driven by the Sim Leader, but there will be opportunities for players to engage in their own subplots. Event threads will be a mixture of combat-focused and social-focused threads. New players are welcome without requiring Wing Commander background or knowledge of the MUSH events beyond what can be gleaned from Ship Wide Messages and After Action Reports. The rules are light, just be respectful to other players out of character and you are good. The player-base is very friendly and mature. 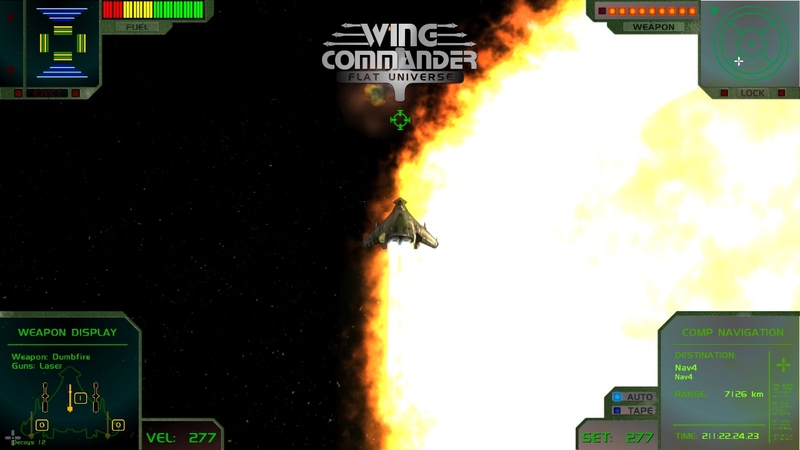 Arraen has posted the second preview video for his Wing Commander strategy mod, Starship Tactics. 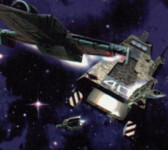 It features the Tallahassee cruiser dominating a battlespace dotted with Kilrathi transports and corvettes. The Dorkirs don't stand a chance! Fighters are often the star of the show in Wing Commander games, so it's nice to see the capships take center stage once in a while. I do wonder though if pilots attempting to land in the aft run into issues with all that engine flare... You can also see the Venture corvette in action here. 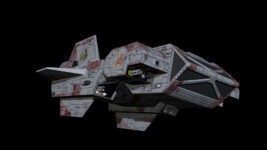 Now I want to show you my version of Tallahassee cruiser in action. Mission is the same - Kilrathi convoy, but now instead of Venture, cats have met a big guy with guns. 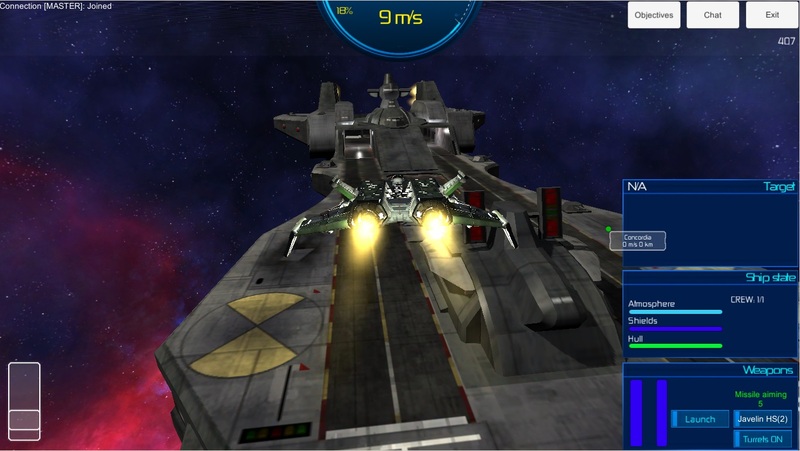 Also I've updated GUI, turrets and mission objectives system. 17th Birthday Party One Month Away! 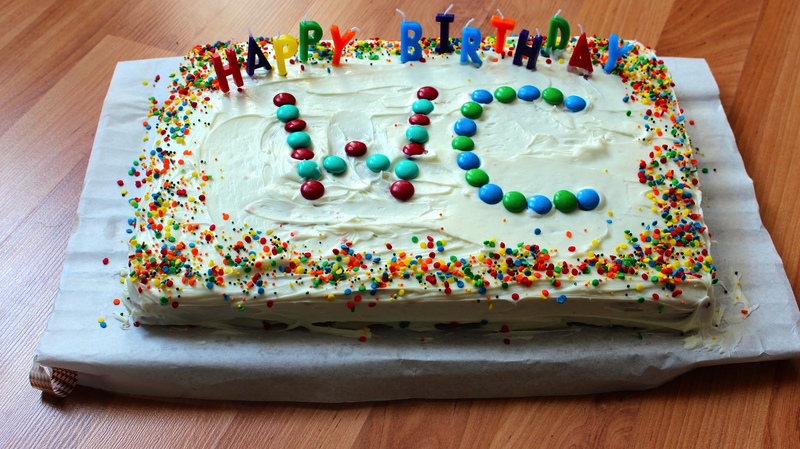 We're excited to announce the date for the next CIC Birthday Party: Saturday, August 15, 2015. Longtime visitors will recall that our actual birthday is historically on the 10th, but last year we began adjusting the event date so that it falls on a convenient Saturday evening for most visitors. We'll be turning 17 years young this year, and you're invited to celebrate with us! The gathering place is our IRC chat room #Wingnut. No special software is needed if you fire up our browser client. It's easy to pop in and say hello any time - it should even work on most modern smartphones or tablets! 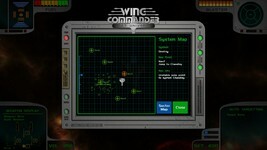 On the 15th of next month, Wingnuts should shoot to arrive at 7:00 pm EDT (4:00 pm PDT and 11:00 pm GMT). Festivities should last at least a couple hours with lots of fun stories, trivia contests and birthday updates. See you there! 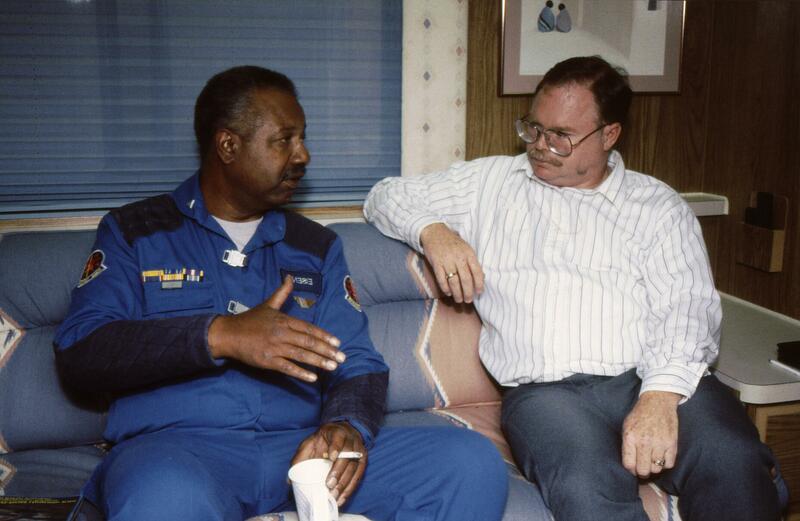 When we last checked in with Wvlfy, he had emerged victorious in the Vega Sector, conquered both Secret Missions campaigns and was well into the Niven System in WC2. Not only has he now made it to Ghorah Khar, he's also circled back to the losing missions of WC1 in Hell's Kitchen. With few exceptions, most YouTubers stick more or less to the winning path. Destroying the Star Post feels better than retreating from the sector, but there's some very interesting missions on the losing track! It's worth a watch just to see the tone of the characters' dialogue in the bar and briefing room. 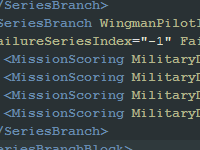 Check the first mission out below and see the associated playlist info for subsequent clips. The Confederation is officially out of funds due to a sudden rise in premature ejections, but the true disaster is the dwindling stock of liquor at the bar. 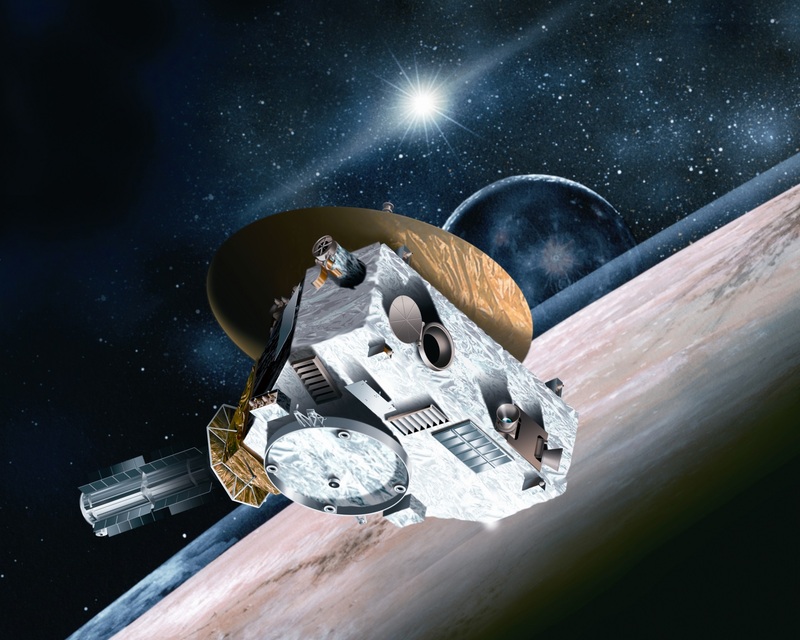 The New Horizons spacecraft made its historic flyby of the Pluto this morning. 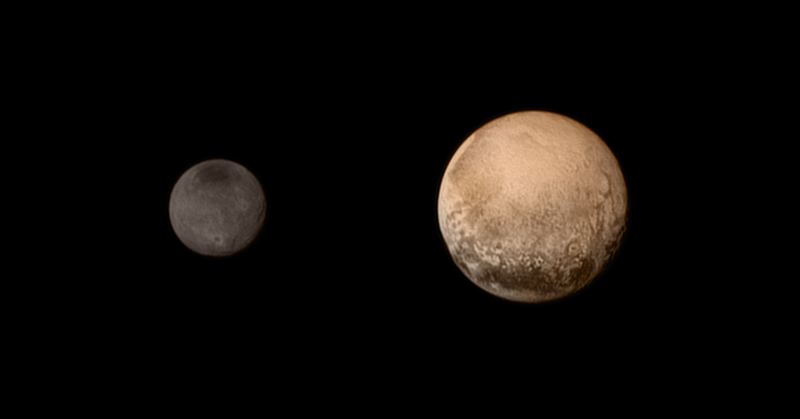 There have already been some fun pictures of the dwarf planet and its moon, Charon, in the news, but these are just the previews shot with a long range camera! 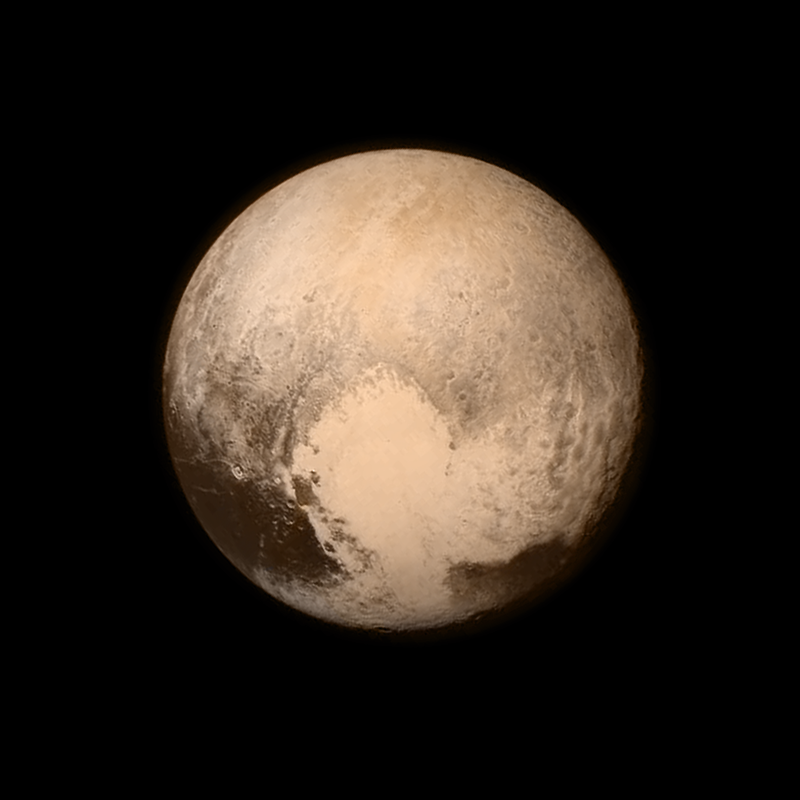 The real close-ups should be trickling out in the next few days. We can't wait to see! 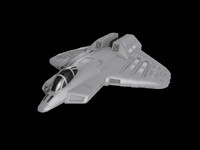 Klavs continues to build out his civilian fleet with the heavy Centurion. It's great to see this model in high detail with an aggressive fuselage nose and sleek upturned wings. 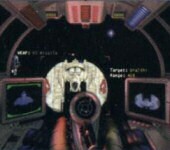 We very nearly got to see a modern take on the design in Wing Commander Arena. 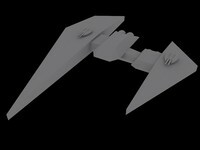 That would have been a fun angular variant of the craft, but Klavs' take has more pleasing aerodynamic lines. 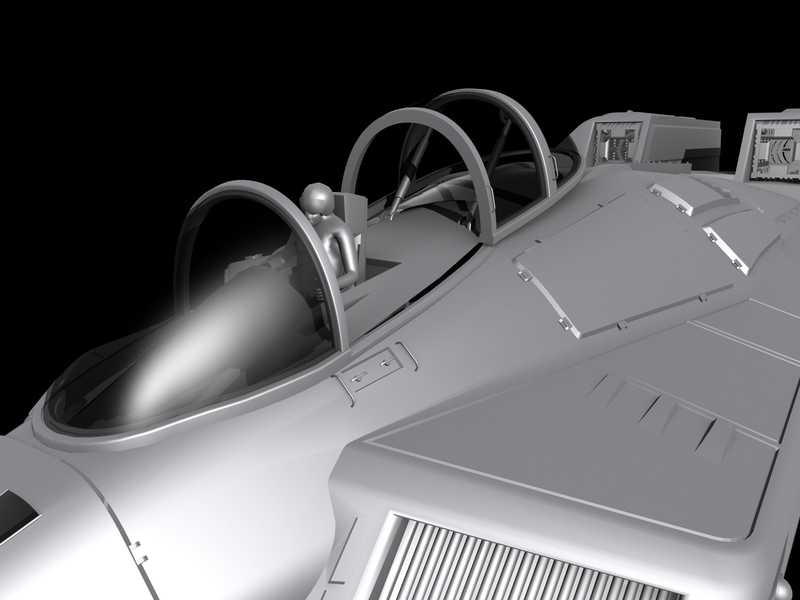 Fancier textures are in the work, but it's not too hard to imagine what the gray fighter's final livery will look like here - very nice!. 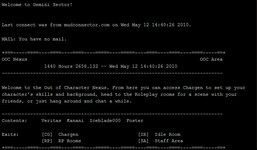 WingOver has created a modified version of delMar and UnnamedCharacter's Secret Missions 1.5 package that is designed to run with Kilrathi Saga. 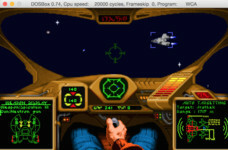 DOS versions of the early games have seen a huge resurgence over the last several years with the popularity of GOG and DOSBox, but many pilots prefer the enhancements that came along with the Windows editions released in 1996. 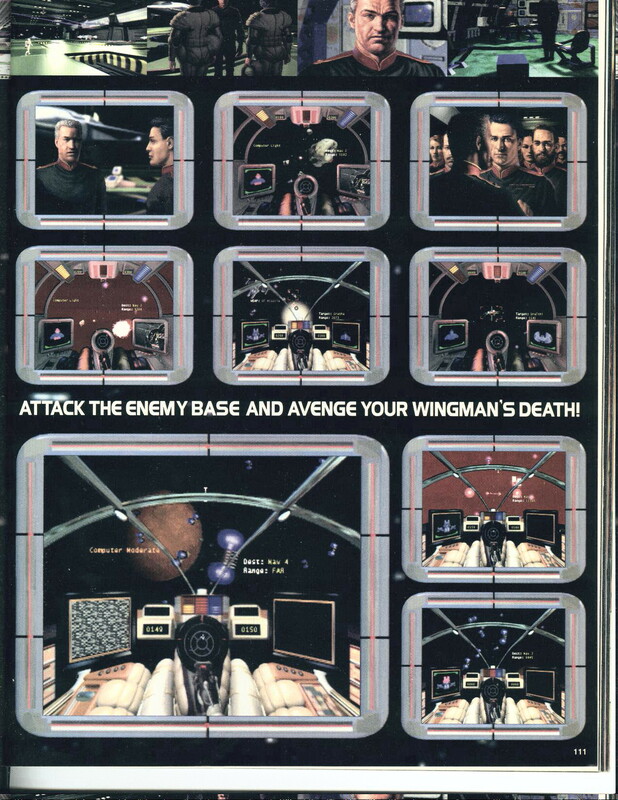 Now these players have a chance to try out the extra missions that are included with Super Wing Commander (back ported to the original game engine). First, back up your install.dat in the KS gamedat folder (and make sure your KS install includes The Secret Missions already). 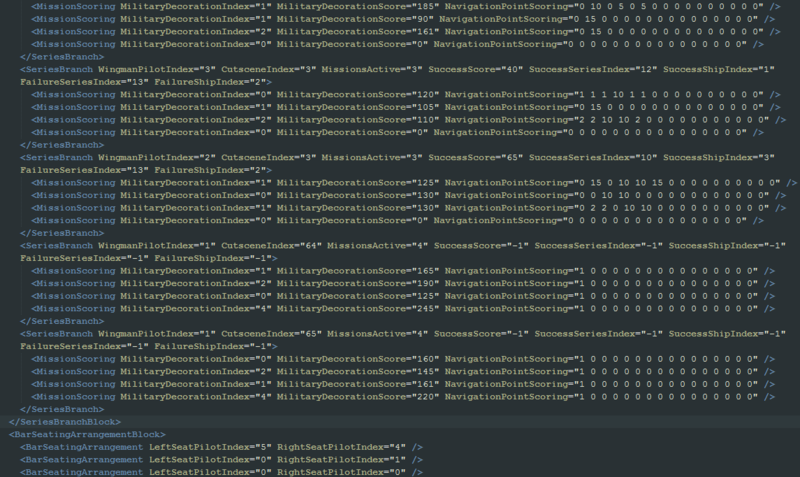 Then unzip the contents of this file (60 k zip) into gamedat. It includes a new install.dat that will replace Secret Missions 2. You can flip back and forth between iterations of the file to choose which campaign you want to play. 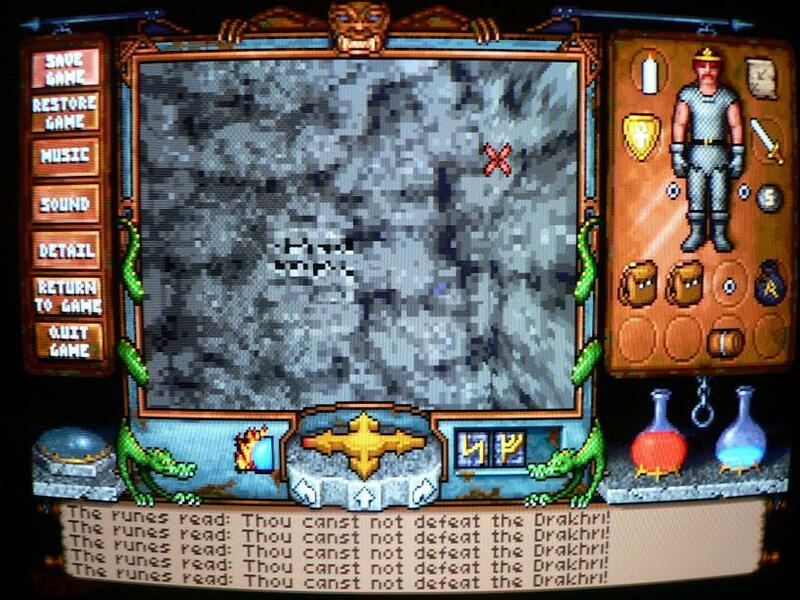 If you'd like to give this a try on your DOS-based WC1 install, grab that version of the patch here. This is about bringing the Secret Missions 2 campaign from Super Wing Commander and 3DO, known as Secret Missions 1.5, to the PC. 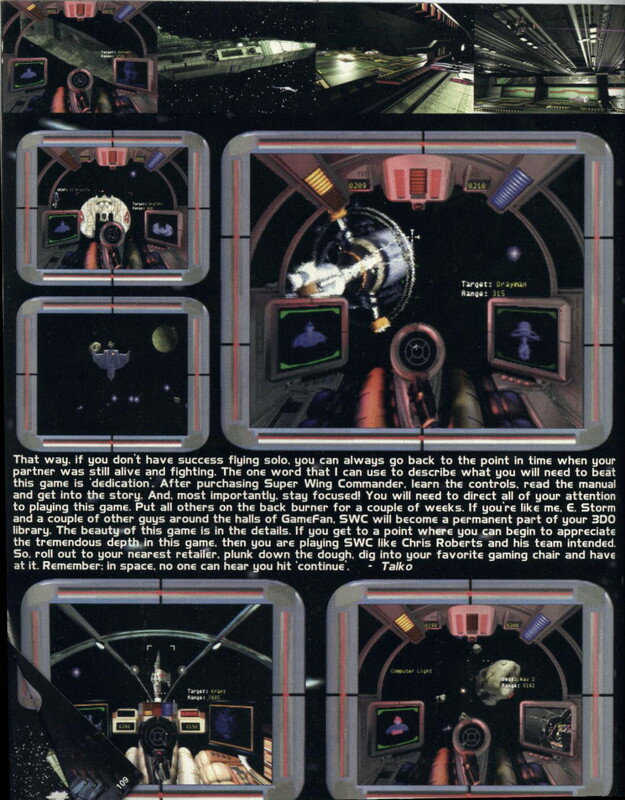 For a start, I'll just make the files available here that have been converted 1:1 from the 3DO version. That's possible due to the awesome work of UnnamedCharacter and many others who paved the way. The zip file contains a readme file with all necessary information and instructions. 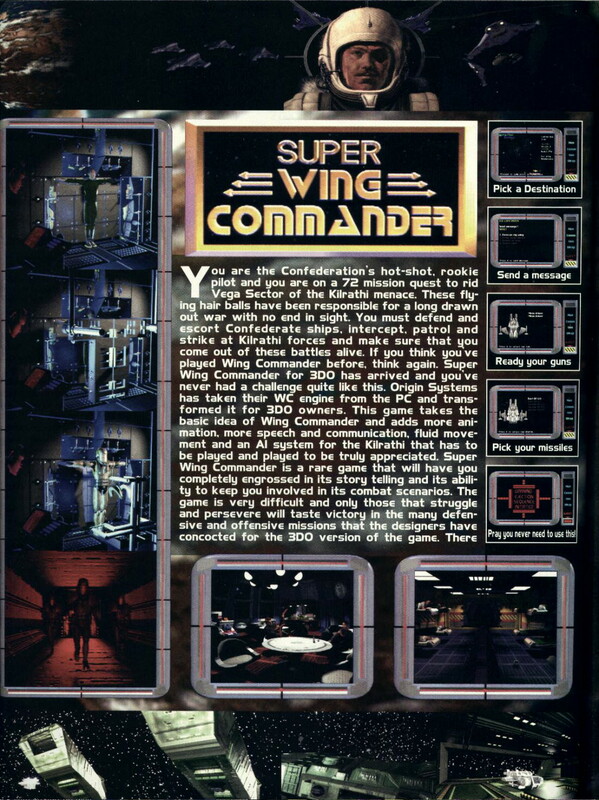 So, by downloading and installing this zip file to your Wing Commander I, Secret Missions 2 installation, you should be able to play the full SWC Secret Missions 2 campaign, which is commonly referred to here on the forums as Secret Missions 1.5. Where Did The Classic Franchises Go? 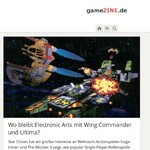 The German website gameZINE has posed a very good question: "Where is Electronic Arts with Wing Commander and Ultima?" They cite titles like Star Citizen and The Witcher 3 to demonstrate a resurgence in epic space sims and single player RPGs. Whether via remake or sequel, they agree with us that the brands still carry tremendous name recognition and have a legion of latent fans. CIC readers are well aware of this, but it's nice to see a little international confirmation! There is some potential for EA's Dragon Age and Mass Effect series to cause some internal competion in the RPG and sci-fi arenas, but there's plenty of precedent out there for companies to develop similar franchises alongside each other. The full article is in German, but you can check out a Google translation here. 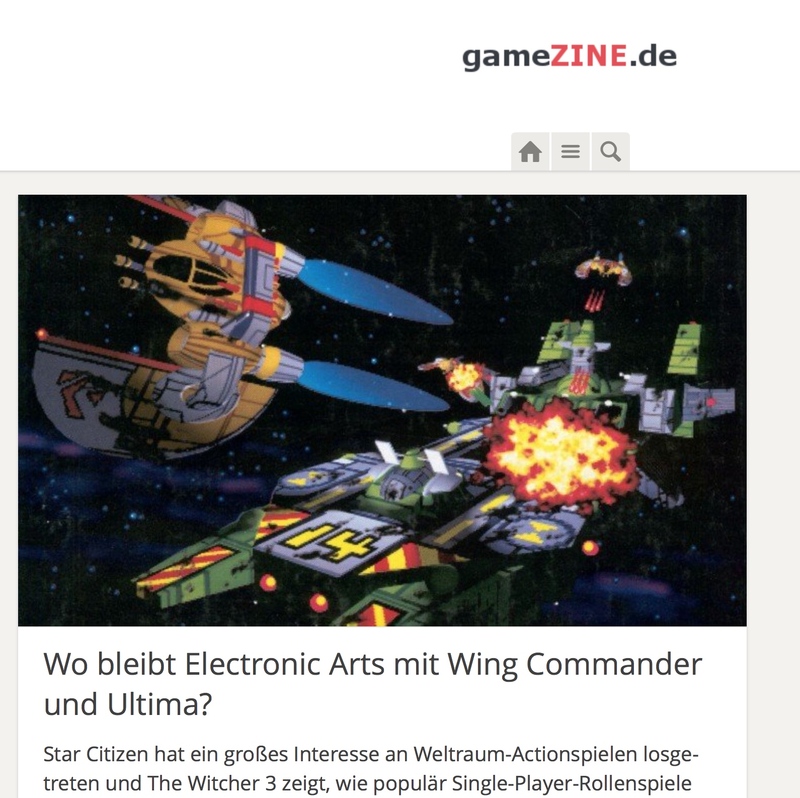 Was Electronic Arts mit den Marken Wing Commander und Ultima vor hat, ist ungewiss. Doch wer weiß, vielleicht überrascht uns das Unternehmen und kündigt bald ein Spiel zu einer der Serien an. 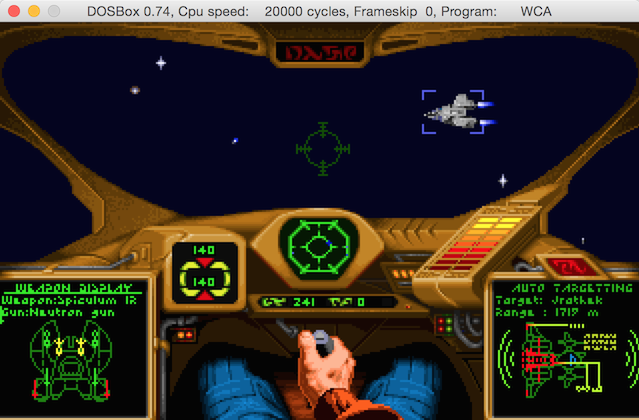 Wenn wir wetten würden, dann würden wir dies auf Wing Commander tun. Random observation: Their top article image appears to be a crop of one of our old box scans. You can see a better version of the actual render below! 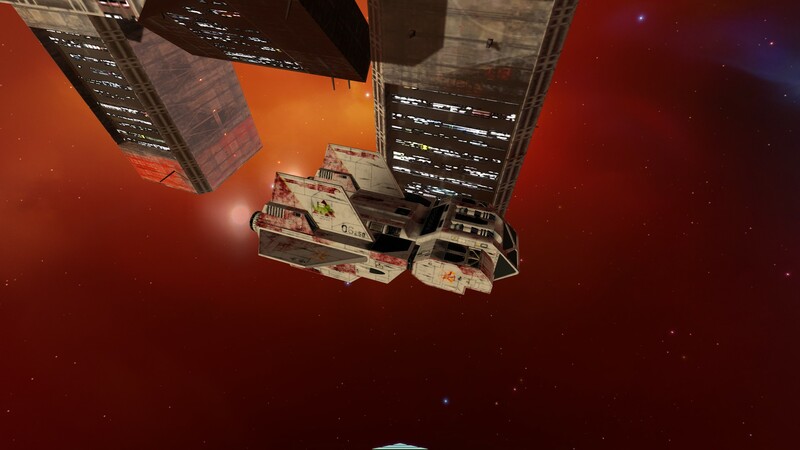 The Saga Plus team is working on a cool new feature: a debris mod for capital ships. In Saga's engine, capital ships are destroyed in a large explosion that leaves nothing behind. 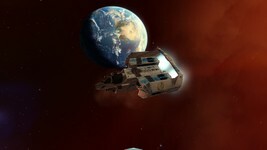 With this patch, large pieces of hull wreckage are left careening through space, damaging anything that gets in their path, including the player's ship. Luke has provided a short video to demonstrate this upcoming feature. Currently we test an unpublished mod from the WCS team called "Debris Mod". 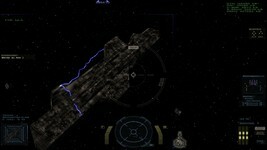 With this all capital ships (Confed & Kilrathi) explode as before but leave wreckage pieces. Every ship has its own set of wreckage. 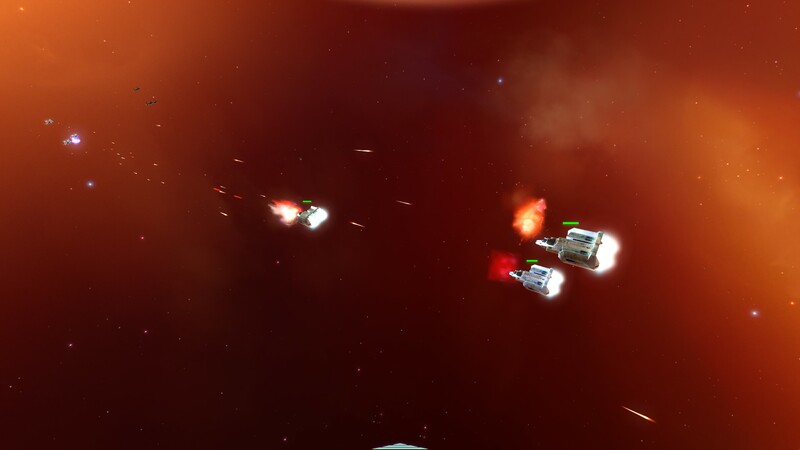 Every wreckage rotates and flies away with different speed. 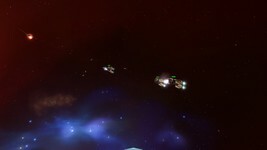 The wreckage have mass so they can damage other ships. The fighter AI can do evasive actions to avoid collisions. 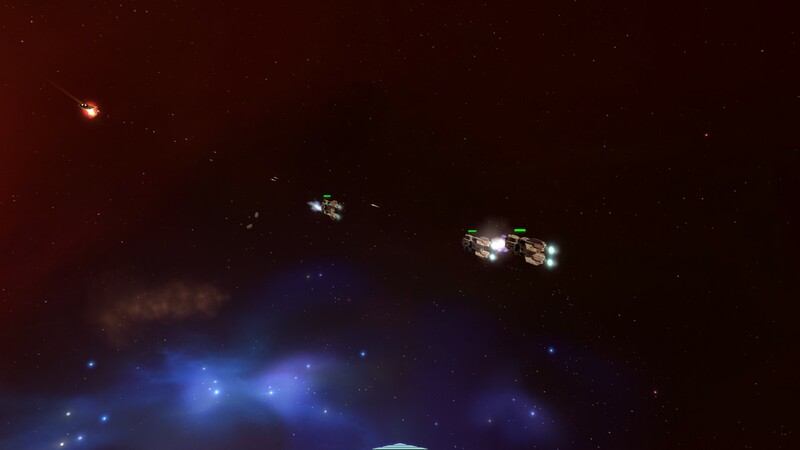 Both sides affected by the Debris Mod, so this brings a bit more dynamic to a battle. 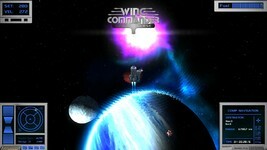 HCl has made further progress on importing ships into Wing Commander 2/Academy. 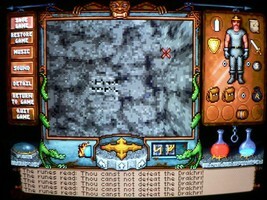 Here he's managed to get the Arrow running smoothly, as seen through the eyes of a Jrathek. 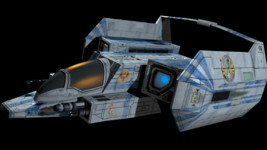 HCl is still trying to figure out what kind of stats the ship should have while operating with other mid 2660s fighters. If you have a recommendation, hit the comments button below and let him know! Also, when asked about the possibility of someday modding Privateer with these new techniques, HCl was fairly optimistic - which is very exciting! The Privateers are some of the least hacked games in the series, but they have some of the biggest potential for expansion. Definitely, I'd love to import ships into Privateer some day as well :) From what I remember, the format is pretty much the same, or very very close, so I think it would be trivial to adapt this script to import new ships into Privateer! (the palette needs changing, the packaging might need some tweaking, as Privateer started using IFFs for ship encoding, but the RLE compression used by the game is definitely the same) If anyone wants to do that, do let me know! DefianceIndustries has posted completed shots of his impressive Vindicator model. 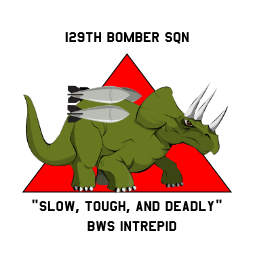 It's been customized with special nose art and markings that indicate that it calls the BWS Intrepid home. 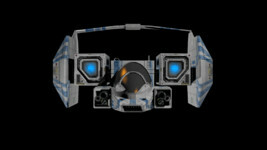 Overall geometry is pretty accurate compared to the original design, although in this version you can more clearly see the array of weaponry that it packs on the cheek mounts. The model will see action soon as a new addition to the Homeworld mod, but this is your chance to examine it here first! Here she is, virtual hangar queen no longer. Vindicator #92109 "Slightly Dangerous", bearing her 147 Saberhawks livery off BWS Intrepid. Of all the UBW ships, this one is my favorite. 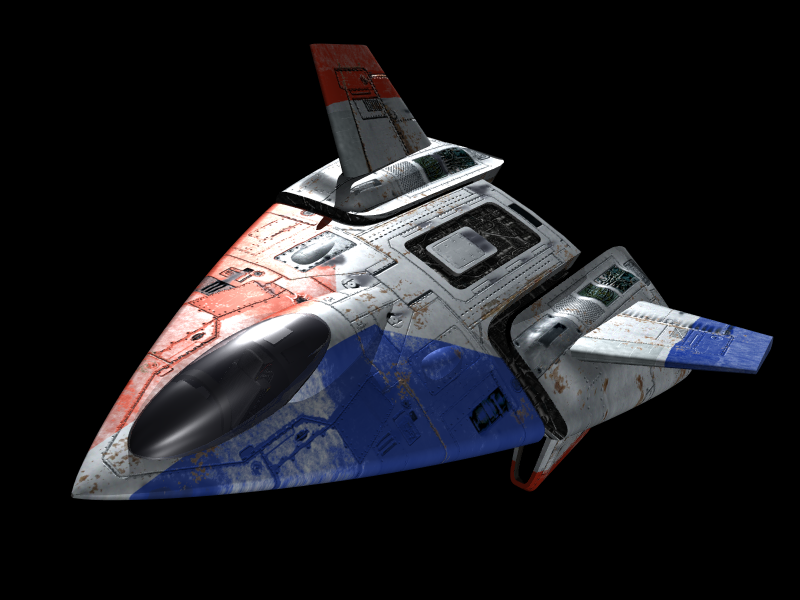 The Banshee is a close second, but the Vindicator's lines are vaguely reminiscent of an F-4 Phantom, big, chunky, and in the hands of the right pilot, downright deadly. For those who may not have seen the update at Kickstarter a little while back, George Oldziey has provided another report on status of his orchestral Wing Commander album. 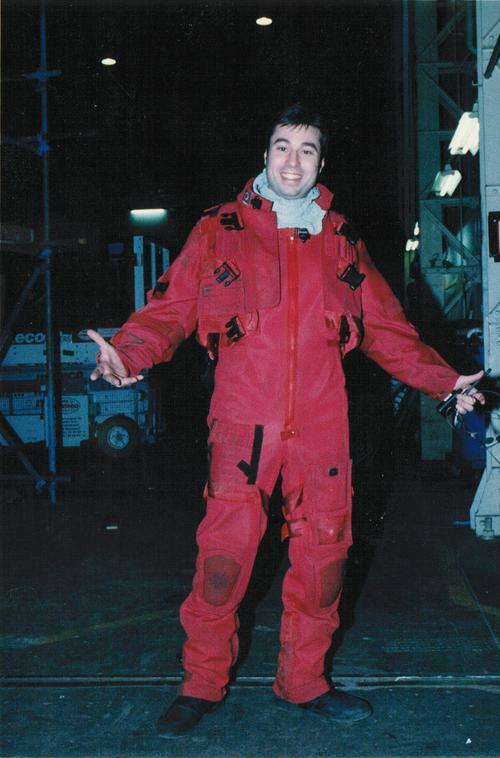 We've heard from some fans who were under the impression that the project was finished when Mr. Oldziey released his collection of tracks at the end of last year, but work still continues. He's about half way through the supplemental digital reorchestrations that will be combined with the live performance on the physical album. We'll let everyone know when it gets closer to release! Greetings all! First of all, I'm WAY behind schedule on getting you all the physical CD rewards. Besides my full time teaching gig I've been flooded with studio projects in recent months. BUT, that's no excuse to be so late. Good news is I'm about half way through the digital re-orchestrations of the addition 15 minutes of music on top of the 30 plus minutes of orchestra music you already have. 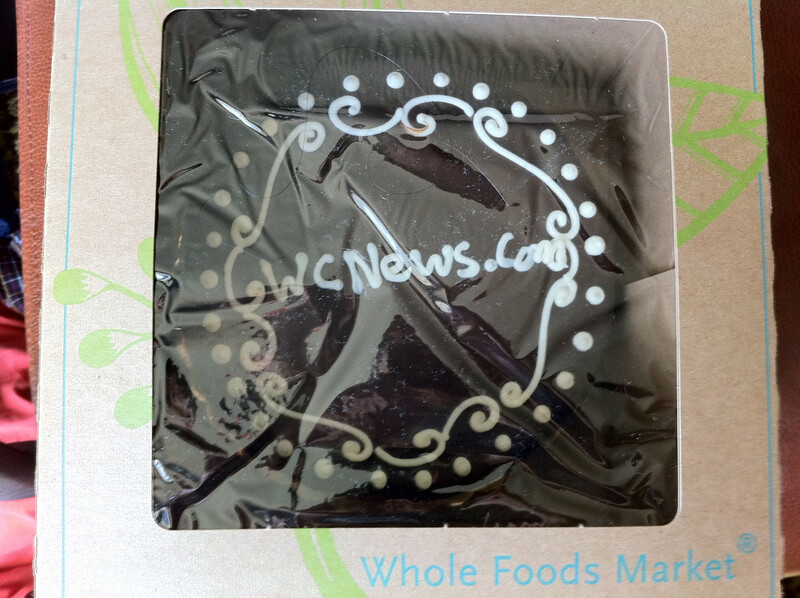 Once those are done, mastering and making the physical product should go quickly. I'm guessing (early?) summer delivery. Again, so sorry to be delivering the CD late. You are all so wonderful, and I really appreciate your patience and dedication! 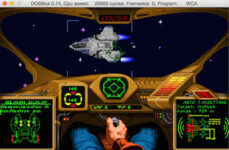 Last month we noted how rare thorough video reviews are for Privateer, and then we stumbled across a massive playlist by Necroscope. He's covered the game in fifteen installments that range from about 30-60 minutes each. That's a lot of Gemini Sector action! It starts out covering the basics and then explores the story. 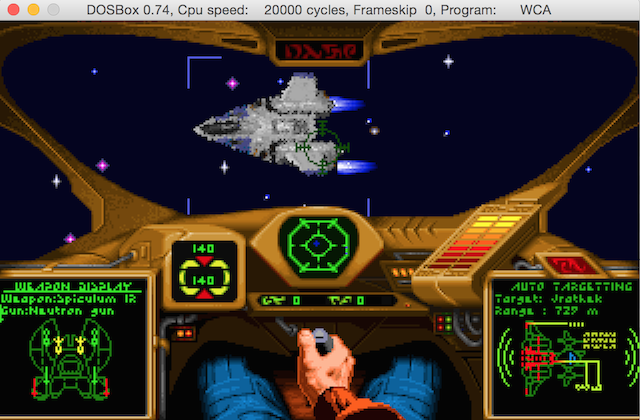 The player flies through the game in an Orion, which is a somewhat uncommon choice, so it's nice to see that cockpit on screen for a change. 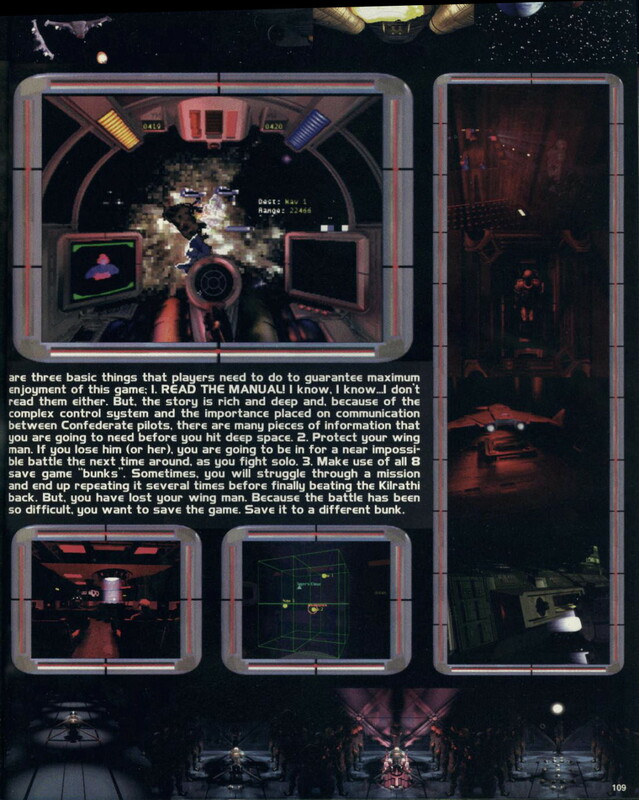 Having such a comprehensive play through at your fingertips is also great if you want to quickly refresh great memories like running the blockade at Palan or exploring the derelict in Delta Prime. Episode 1 is below, and you can check out the entire series here. Klavs has made some great Excalibur wallpapers over the years, but it's always fun to see what other talented artists can do when they don't need to build all of the art assets from scratch and can instead just focus on setting up a scene. Chris Kroznuski made this wallpaper with a simple background, but it pairs the Excal with the terrifying Hhriss in a match-up I don't think we've ever seen before. 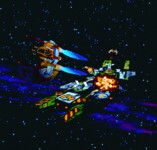 Although it appears the Kilrathi heavy fighter has the upper hand, there are very few dogfights the Excalibur can't win. The title is "Hairless Ape Escape," so even if the Confed pilot has been forced to turn back, it can easily outrun its Kat counterpart! 239 years ago, the 13 American colonies declared themselves a nation, independent of the British Empire. Many of our visitors and staff are out enjoying a weekend filled with family gatherings, barbecues, carnivals and fireworks. To our international visitors, have a great weekend wherever you are! A few years ago, we did a brief rundown of the wealth of Wing Commander inspired imagery that can be found on the DeviantArt website. 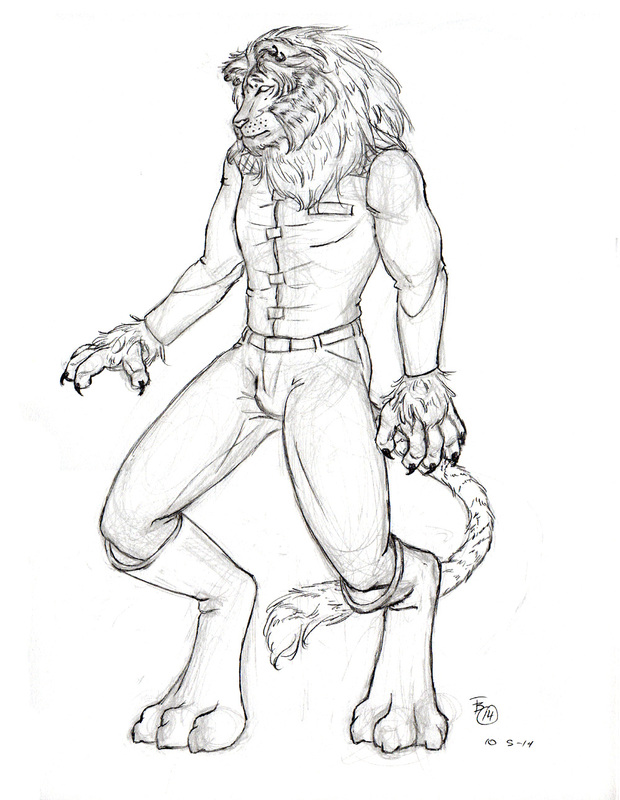 AD's come across a new pencil sketch of a Kilrathi, created by AirenWoodmoon. Like most Kilrathi drawings on DeviantArt, this one seems to draw mainly from their Wing Commander 3 appearance. I'm so stupidly proud of this one. :3 I haven't drawn Kilrathi in years, not since high school really, and so I'm thrilled with how he came out. It's a good week for Bearcats! 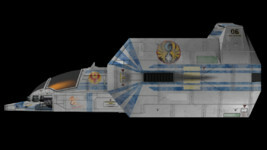 ScoobyDoo has added to the fun with a new take on the cult classic postwar heavy fighter. The shape is solid, and it's covered in Scooby's trademark hull details. He's working on importing the ship into the Unreal 4 engine to get the craft animated and show it off in its fully textured glory. You can see how this progresses at the CIC Forums here. Line art is a bit of a lost art these days, but Red has used the technique to put together two pairs of capships from the Wing Commander Movie for Wolf's Shipyard. 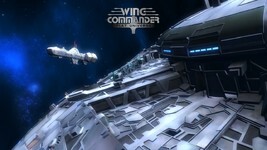 The Confed fleet gets both a Bengal carrier and a Concordia supercruiser. 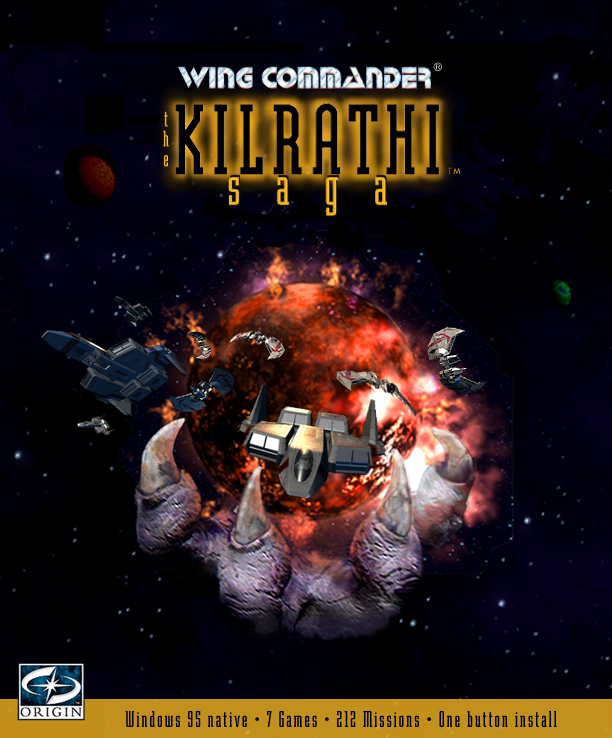 The Kilrathi get a Sivar and Snakeir. All of the thumbnails are a bit squished down to keep your page widths in check, but be sure to blow up the images to full size to see all of their fine detail!